Montreal, February 25, 2019—Mathilde came into the world with chubby cheeks and a full head of auburn hair. But she was a very sick baby, and was immediately transferred on January 19, 2013 to the Neonatal Intensive Care Unit at the Montreal Children’s Hospital of the McGill University Health Centre (MCH-MUHC). By the time she arrived, she was sicker than initially expected; Mathilde’s small head was of particular concern to doctors. She underwent neurological tests, and sadly, they came back abnormal: her brain hadn’t developed properly and her brain white matter (or myelin) was found to be atypical. Doctors confirmed she was suffering from an unidentified kind of genetic leukoencephalopathy, a family of diseases affecting both the nerve cells and the white matter. Mathilde passed away when she was two-and-a-half months old, surrounded by the people who loved her most. Thanks to an international effort led by physician-scientists at Rady Children’s Institute for Genomic Medicine (RCIGM)-San Diego in California, Dr. Geneviève Bernard’s team at the Research Institute of the McGill University Health Centre (RI-MUHC) was able to confirm the diagnosis for Mathilde: she died from VARS-related disorder, an extremely rare neurodevelopmental condition. Their findings, which were recently published in Nature Communications, are paving the way for the first step in developing potential therapies for this rare neurodegenerative condition. The Institute is leading the way in advancing precision healthcare for infants and children through genomic and systems medicine research. Discoveries at the Institute are enabling rapid diagnosis and targeted treatment of critically ill newborns and pediatric patients at Rady Children’s Hospital-San Diego and partner hospitals. The vision is to expand delivery of this integrated translational research process to enable the practice of precision pediatric medicine at children’s hospitals across California, the nation and the world. RCIGM is a subsidiary of Rady Children’s Hospital and Health Center. Learn more at www.RadyGenomics.org. Follow us on Twitter  and LinkedIn. The Research Institute  of the McGill University Health Centre (RI-MUHC) is a world-renowned biomedical and healthcare research centre. The Institute, which is affiliated with the Faculty of Medicine of McGill University , is the research arm of the McGill University Health Centre (MUHC)  – an academic health centre located in Montreal, Canada, that has a mandate to focus on complex care within its community. 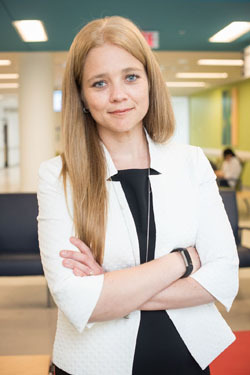 The RI-MUHC supports over 420 researchers and close to 1,200 research trainees devoted to a broad spectrum of fundamental, clinical and health outcomes research at the Glen and the Montreal General Hospital sites of the MUHC. Its research facilities offer a dynamic multidisciplinary environment that fosters collaboration and leverages discovery aimed at improving the health of individual patients across their lifespan.